"This is a delicious, filling, and healthy breakfast. It also makes a great lunch, snack, or dessert. Add a tablespoon or two of walnuts for a satisfying crunch!" 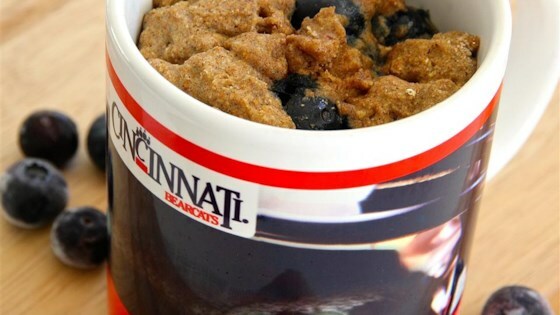 Mix flour, oats, baking soda, cinnamon, cloves, nutmeg, baking powder, and salt together in a microwave-safe mug. Stir egg white, milk, brown sugar, and vanilla extract into flour mixture until batter is fully combined; slowly stir in blueberries. Cook in microwave for 1 minute. Check muffin for doneness and continue cooking in 15 second increments until cooked through, about 1 minute more. Your morning muffin in moments! Substitute 3 tablespoons egg white substitute for the egg white if desired. Blackberries or raspberries can be substituted for the blueberries. I made mine without all of the extra spices and it was still super good. Fast and easy, 5 stars! I will make this again. I substituted all-purpose flour for the whole wheat flour, as I like it better, and rice milk for the milk. It was great! I used almond milk and put some Light Vanilla Yogurt on top. I'll for sure be making this again. I did not care for it.